Provide underwater structures. These are important because they provide a refuge for smaller fish. Place pallets, formed into tepee shapes, on the bottom of ponds. Christmas trees are another good structure. You should burn off the needles first, as they can plug pumps and put a large amount of organic material into the pond. You don't want to build more than three or four structures per acre. As aquatic specialists we are well positioned to provide support as a third party. Assisting professionals to provide a pond or water feature that works perfectly within the overall project. 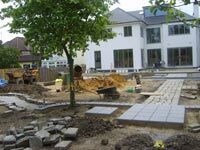 We often work with builders, garden designers landscape architects and landscape gardeners where they would be the main contractor on a project that has either a pond or water feature as part of the construction. We either undertake this part of the works as a sub contractor or consult and oversee. Consult and oversee means that the main contractor would usually undertake the main constructional tasks under our guidance. We would compliment these works by providing and installing the aquatic specific parts of the project. These are the two main guises but we are keen to support in the most fitting role. Should you be working on something at the moment and feel we could be of use we are always happy to discuss your plans over the telephone so you can understand how we can help. If you want more information, please call us or click here.